A nurse stuck her head in to say someone was asking for me at the door to the hospital’s maternity area. I opened the door in a daze. Standing there was my father-in-law. He took one look at my face and – without a word – gathered me into one of those bone-crushing hugs he was known for. It took a few moments, but I finally got my voice back to explain what was going on. I had called both sets of parents at midnight when we headed to the hospital, but there had been no time for an update during the wee hours. Now my in-laws had come to the hospital and were not about to be turned away. Newly fortified, I went back inside to the surgical suite, where about 30 minutes later I got to hold my new son – Clay’s older brother – in my arms. That was just one of the many times that my father in law, known to the family as Grandpa Tony or just Goots, came offering unquestioned love and support. Having lost his own father before he was born, he was raised by his mother and a gaggle of aunts and uncles. Family meant everything to him. He was a man with a love of food learned at the table of a mother who thought nothing of cooking all night before a holiday meal. A man capable of an explosive temper one minute (“get away from the effing blinds”) and a tearful “love ya” outpouring the next. A man who filled every room he entered. Goots was an unquestioning supporter of Clay. Reveling in the stories we shared of the little guy’s typing or his progress at school. Reaching for his checkbook – unasked – to pay for therapies or equipment like Clay’s monster swing. When he was healthier, he never missed an entry on this blog and frequently commented as Gpa Tony. We lost Goots in November. I have other stories I could share, but I want to leave it with the one that morning when my son was born. He was there for me then, like he was there for all of us so many times. That is how I will remember him. Clay, of course, has his own memories of his grandfather somewhere inside. 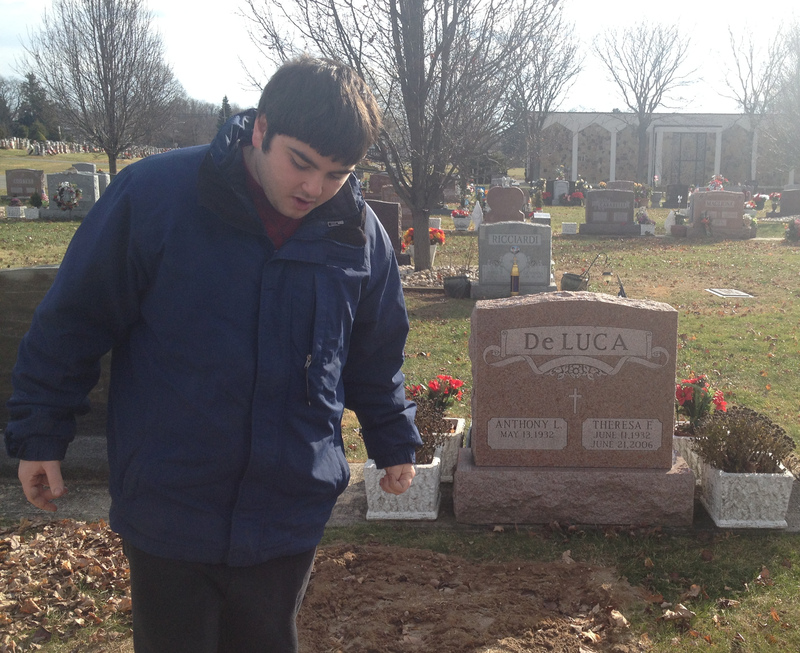 We kept him home the day of the funeral knowing the crowds and the chaos would be too much for him, but my wife took him to visit the grave site earlier this week. He walked around pensively, smiling at times, and wanting to linger when it came time to leave. Afterwards she asked him what he thought of going to the cemetery. 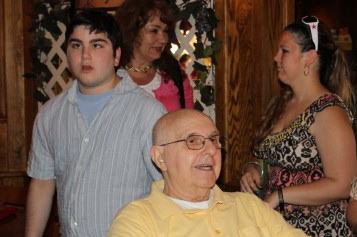 Rest in peace, Gpa Tony. This entry was posted on November 26, 2014, 1:38 pm and is filed under Communicating, Daily Life. You can follow any responses to this entry through RSS 2.0. You can leave a response, or trackback from your own site. Sorry to hear of your family’s loss. May your memories of him bring you comfort and joy in time.